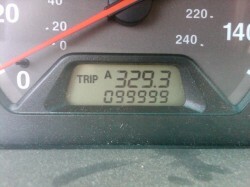 All week long I have been watching the odometer because I was getting near 100,000 miles. I get home Thursday night and notice that I am really close to that number and I had to travel to White Plains the next day, surely enough to put me over the mark. So I was able to get the shot I wanted for this post! Not so bad really for a 2001 Honda Accord that I got in 2004 with 9,801 miles on it. This baby should last me another six years or so.